There are some of you out there who aren’t weird like me. You don’t enjoy kneading bread. This recipe is for you! I got this recipe from my friend, Angela. Angela is a super-mom. She can do anything. This is how she makes her bread, and I have to admit – it’s nice. It lets you do other things in the kitchen while the mixer is doing all the work! Too bad I can’t hire the mixer to dust my house. It makes nice, big loaves that are great for sandwiches. So, let’s get mixing! We need bread flour, yeast, eggs, salt, water, sugar, and oil. Pretty simple. This is stuff you should keep around your house if you ever plan to make bread. This is my mixer. It’s not a Kitchen Aid, but I love it anyway. Sure, I’d love to have a nice, red, shiny Kitchen Aid but I chose this one instead. I saved for a few months and bought this one at JCPenney. It’s their store brand. I chose it because it happened to have more amps or horsepower or pony watts, something like that. (Insert Tim the Tool Man Taylor grunt.) We’ll be using the paddle and the dough hook attachments. First we dissolve our yeast in the warm water. Remember what I’ve said before. WARM. Not hot. Do not commit yeast murder. Thou shalt not kill. To the yeast mixture add the salt, oil, sugar, eggs, and 3 cups of the flour. Beat this with the paddle attachment for ten minutes. While it’s beating, do something constructive like wash the dishes, pick up dog food, or scrape old oatmeal off the underside of the table. This is the dough hook. Yes, it looks scary. It makes you think about Peter Pan doesn’t it? It’s ok to admit it. 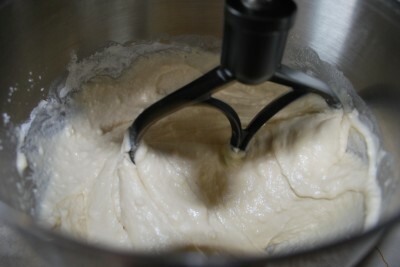 Add the remainder of the flour and “knead” with the dough hook for another 10 minutes. Again, take this time to do something constructive – fold laundry, pry a baby off your leg, or eat a snack…..not too much though because you have bread coming! See, here it is kneading. It’s an action shot. Sorry about the quality. I’m still working on how to take good photos of that. Imagine that you’re actually seeing it move. Move your head side to side. I promise it helps. Thanks. Ok, when it’s done you want to take it out of the bowl and put it into a large bowl that’s been greased. Turn the dough over so that it gets greased all over. 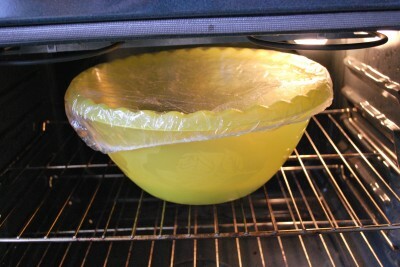 Cover the bowl and place it in a warm place to double, about 45 minutes. I like to raise mine in the oven because the temperature is consistent when the light is on. It’s not fat…..it’s just poofy. I forgot mine was in the oven and got busy with Annie. I think she was taking all her shoes out of the drawer and hiding them in various places. When I remembered to go check, it had been over an hour and mine had risen…..a lot. It almost came over the side. Do you remember that I Love Lucy episode where she’s attacked by the large loaf of bread? That’s what I was thinking about here. I punched it down and all was well again. Turn your dough out onto a floured surface and divide in half. Knead just a little bit and get the bubbles out. Angela’s recipe says “slap out the air bubbles.” I did slap it. It was sorta fun. Good therapy. Who needs a psychologist? Make bread! 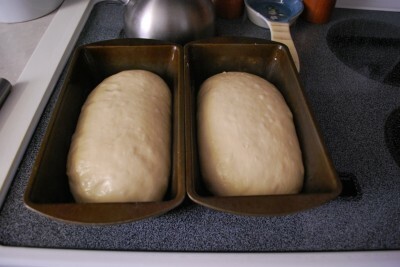 Form your halves into loaves and throw them into two 9 inch pans that have been greased or oiled. Turn the loaves over so they’re totally coated and won’t stick to the pan. Cover the pans and let the dough rise again until doubled. My kitchen was pretty hot, so it only took 30 minutes. This could vary though…….bread is so fickle. I love it though. It’s consistent in its fickleness. Here it is ready to go! It looked pretty big to me…..almost too big. Like it was going to take over. Again I thought about the I Love Lucy episode. I put Annie down for a nap to save her in case there was a bread emergency. Carefully move it to your 375 degree oven. Bake until it’s brown, about 30 minutes. You know it’s done when it sounds hollow when you tap it. That’s the best test for making sure any yeast bread is done. See how HUGE it looks? I couldn’t believe I made something so big. It was intimidating me. But it smelled so good that I got over it quickly. Let the bread rest in the pans for 10 minutes before you turn it out to cool completely. Look how pretty! When I cut it, I realized that it is a great size for making sandwiches. Great recipe, Angela! Thanks for sharing with us! It’s really very easy and you should try it today. Your hips will thank you. Hips don’t lie. Pour warm water into your stand mixer bowl. 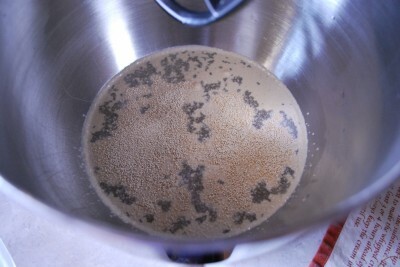 Add yeast and stir around to dissolve. To this mixture add the salt, oil, honey, eggs, and 3 cups of the flour. Mix on speed 1 for 10 minutes, using the paddle attachment. 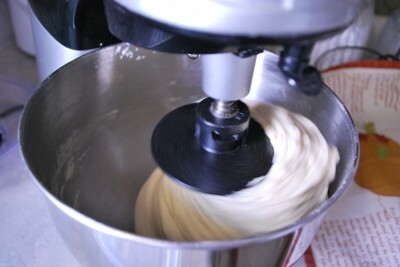 Add the remaining flour and mix with the dough hook attachment for 10 minutes on speed 1. If it’s a little sticky, you can add a small amount of flour by hand, but no more than ¼ cup. Put dough into a greased bowl, turning so surface is greased. Cover and let rise until doubled, about 45 minutes. Poke dough down and turn onto a floured surface. Knead or slap to remove air bubbles. Divide in half. 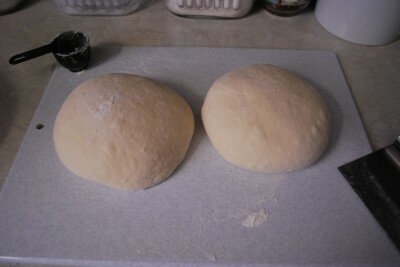 Shape into two loaves and put into two greased 9 inch pans. 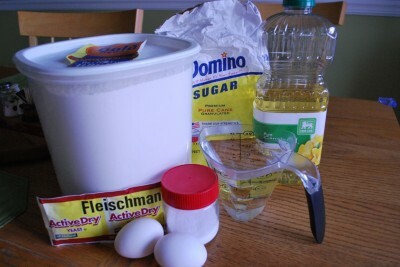 Turn dough to coat surface in oil. Cover and let rise until doubled, about 45 minutes. Bake at 375 degrees for about 30 minutes or until loaf sounds hollow when tapped. Let rest in pans for 10 minutes before turning out to cool completely on wire rack. Looking forward to reading your tips/strategies!!! I would suggest to anyone to read your manual before using your mixer with this recipe based on step 3. Just wanted to let everyone know this possibility. Thanks for the helpful comment, Rachael! I guess I never read my manual thoroughly enough. Appreciate you sharing! 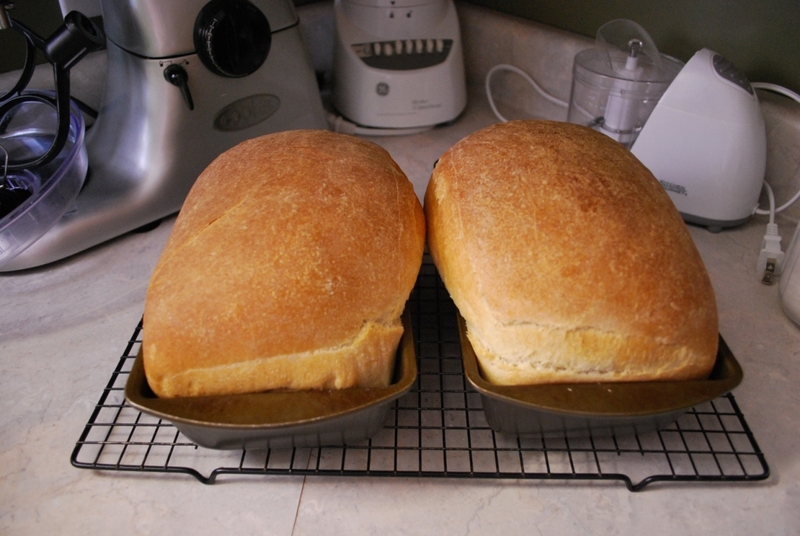 A question…can you tailor this recipe for a single loaf instead of the standard two loaves? My bread actually went over but oh my it smells so good. I haven’t ever attempted to make bread since I failed miserably about 10 years ago BUT! 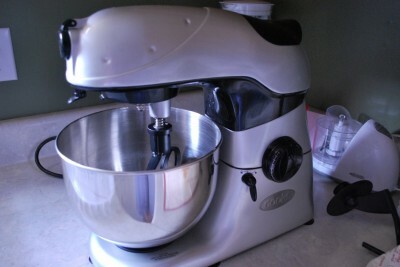 my sweet bf just bought me a mixer as an early christmas gift. I wish i could give people the smell thats in my house! Thanks so much for this simple recipe! Bread flour has a slightly higher gluten content, but you can definitely try the recipe with all-purpose flour. It should work out okay. But this recipe probably wouldn’t turn our properly using self-rising flour. I don’t recommend vegetable or canola oils – not the best flavor or as healthy. But you could try sunflower oil, avocado oil, a light olive oil. Any of those should work! Thanks, Allan. This is a great recipe! It definitely does rise fast. I left it to rise the second time and ran to pick up my daughter from work and stopped by the store. I got back an hour later and it was coming out of the pan… Lol. This is going to be my new go-to bread recipe for sure! Thanks for taking the time to comment, Pam! I think it’s a pretty great recipe too. And that yeast – LOL – it has a mind of its own! I ADORE your sense of humor! Your directions made me chuckles, and I’m looking forward to making bread this afternoon. First time making bread without my bread maker. It launched off the counter today during the kneading cycle. It’s no longer with us. This is so delicious and easy. Believe it or not the dryer makes a great place for the dough to rise. I will be making it again. I’ve heard that about the dryer, but I’ve never tried it! Thanks for the comment, Joe! Your recipe is amazing and simple. My bread turned out fabulous! Thank you very much for sharing it? It will work with less yeast!!! And a very forgiving recipe! I have wanted to bake my own bread for awhile- not a fan of the ingredients list in commercial breads at my grocery. However my kids did not like any of my “rustic sourdough” or even baguette- y type. For now this is a great transition to sour dough. I have made it several times. I cut the yeast down to half a packet and let it rise for longer and kids still love it. I have also over proofed it many times – just punched it down and by let it rise again – it was delicious all the way! Awesome Amanda! It’s always such a good feeling when we find a recipe we love and our kids will actually eat 🙂 Thanks for commenting! I AM GLAD YOU WENT TO EXPLAIN HOW TO DO IT IN THE MIXTURE IN THE KITCHEN-AID. MY COUSIN DID IT, BUT HE USED TOO MUCH OIL IN THE RECIPE. GLAD TO KNOW HOW TO DO IT NOW. THANK YOU A LOT. DS. I ALSO HAVE 2 OF THE OLE FASHION KITCHEN AID MIXERS. I DID A LOT OF WEDDING CAKES. I HAVE TO DO THE RECEIPE YOU MENTIONED. THANK YOU FOR EVERYTHING. Yum yum yum!!! Used my new cast iron KitchenAid mixmaster. Perfect recipe. Perfect HUGe loaf.. hehe I didn’t read the last part after 45 min of rising to cut in half. I put it in a big bread pan thankfully and it turned out fabulous ❤️??? I really love the stand mixer bread. Making some right now. I’ll never make any other kind. I made this bread yesterday. It turned out beautifully. I used EVOO since I did not have coconut or vegetable oil. I had to use a little more than the 1/4 flour during the last 10 minute session in the mixer. Nice flaky texture. I even made some honey cinnamon butter to spread on it!! YUMMY! I no longer need to look for an easy recipe….this one won! Thanks. That’s so good to hear:) Thanks for your feedback, Stacey! I made another batch and used whole wheat flour and it did not turn out very good. Any suggestions? Was your bread more dense than before? Sometimes whole wheat flour yields baked goods and breads that are more dense than white wheat flour. 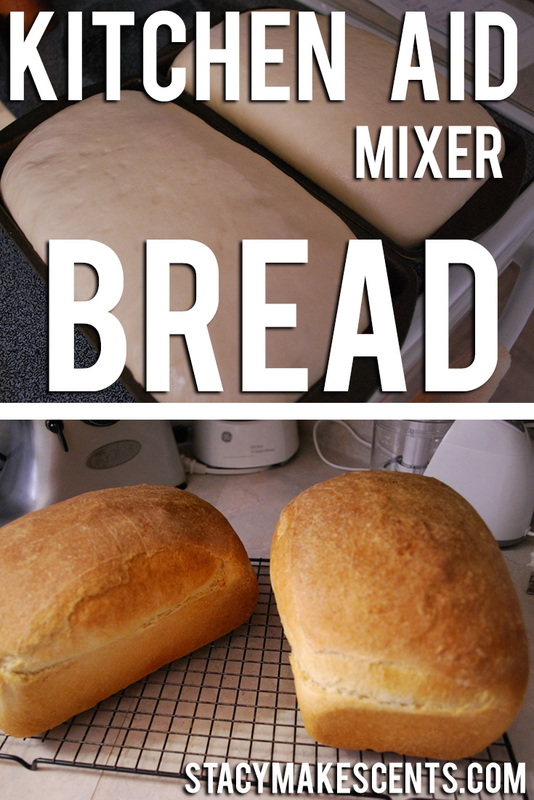 If your bread turned out heavy, instead of tender, I would try using a mix of both all-purpose and whole wheat. I usually don’t do all whole wheat flour. I like to use 2 parts whole wheat flour and 1 part all-purpose flour. I just made this recipe, the bread turned out wonderful! I wil be making it again. thank you ? Does the coconut oil have to be melted so that it’s liquid first? New out great! First time trying this recipe. I love how it turned out and will continue making this one. Thanks! Really good recipe. The coconut oil and honey gives it a unique taste. The first batch (the second one is in the oven) was eaten avidly by my 10 y/o boy, 12 y/o girl and wife. The kids asked me last night whether they could take for school lunch a sandwich made with the delicious bread dad made”. That was just too cool. Thanks for the recipe. Hi, I just bought a 6qt kitchenaid mixer and followed this recipe. The first one started smoking a couple minutes into kneading. I’ve just tried with the replacement and it started smoking 8 min into the 10min. Is it possible to email me? I would love to ask questions to see what I might have done wrong. Otherwise, I love the bread, my son’s and I devour it, and it’s amazing for dipping in soup and stew! I’d love to make it more often, but I keep burning out the motor. Both mixers are brand new. I just found you on Facebook and plan to follow your recipes and meal plans there too. Thanks for all the hard work you put in sharing with us! 🙂 I’d love to be able to make this bread more often! How do your homemade bread to keep it fresh? Thank you! Either in a bag or in a bread box. 🙂 I have one that’s similar to the older Tupperware version. I want to make this bread, but was wondering how you store your bread to keep it fresh. Thanks!! I use a bread bag or I also have a bread box that’s similar to Tupperware. I tried this recipe and the result was just DELICIUS!! I will keep making this bread for my family. Thank you! I used all purpose flour and vegetable oil and it turned out great! Thanks for letting us know, Brigitte! Just trying the recipe now and wonder if I can just spril it into two rounded lumps and bake them on cookie sheets? I don’t have two pans. Sure! That should work great. Baking time may vary so aim for 190 degrees internal temp. Warning to Aussies- this is cake bread. I made a single loaf, with half white bread flour and half rye. Smelled delicious, looked great, but too sweet for sandwiches I’m afraid. Ha ha! 🙂 It’s awesome to know what some people think – I’ve had lots of people tell me it’s not as sweet as store bread. I guess it’s just what you’re used to. 🙂 You could butter it up and have a lovely snack! Yum. Oh man – that sounds amazing. I love goat cheese! I’m wondering why coconut oil and will vegetable oil work? This shouldn’t have worked, as I forgot the oil 20 mins after it started rising for the first time. I considered leaving it but read it may turn out dry, so I took it out, added oil and mixed it for a minute in the Kitchenaid. Well, it’s turned out lovely! A bit gooey, but in a good way. Lots of stretch. I used all-purpose flour, incidentally, and it worked fine. Made my first bread in kitchenaid mixer to dense and over cooked it rose but not good tasting . Yes. Then when it thaws, shape it and let it rise in the pan for it’s 2nd rise. Can you make cinnamon rolls out if this dough? Would you recommend proofing the yeast (using 1/2 up water) and then adding the remainder of the warm water when adding the flour? I tried proofing the yeast with 2 cups of water and it didn’t proof. I then tried with the package recommendation of 1/4 cup water for 2 tsp yeast and it seemed to proof well. Is the rea main in 1.5 cups water still needed? If that works for you, it’s just fine. If you’re using instant yeast, you don’t even need to proof it. For instant yeast, do you just mix the yeast with the flour? Then add dry to wet? Even when I use instant yeast, I do it the same as with active. Just a habit. I just came across your site a few days ago. I am working my way through your 100 Days of Meals. I love using my crockpot! I have a question about this bread recipe. Can I use a gluten free bread flour mixture? Hi Robin – I wouldn’t think so. Bread needs gluten to rise unless you’re using a lot of additional conditioners. I believe the Bread Beckers website has an online class on Gluten Free Baking. Can I substitute ground wheat flour or 1/ wheat 1/2 white flour in this recipe? I know you have wheat or white wheat in your recipe but I was thinking more of fresh ground wheat and not making it total wheat. Sorry if ramblin, long day. Sure. I use fresh hard white wheat in it. Hello! Is there a certain amount of time that the yeast needs to dissolve? Or is it simply, add to the warm water, stir a little and move to the next step? I’ve had other recipes that state it needs to sit for 5-10 mins. That depends on the yeast. If you use instant yeast, you don’t need to let it dissolve. I didn’t have any honey so I used real maple syrup in its place. Here’s hoping it tastes as good as it smells. Oh and I followed the recipe exactly as written except I had to do the kneeding by hand my mixer couldn’t handle it but my daughter had fun helping squishing the dough. I have tried several bread recipes and this one turned out by far the best! I proofed my yeast first. Used vegetable oil instead of coconut. I don’t own a stand mixer so I used a had mixer with dough hook attachment. Great recipe! I am confused. Do you make the bread with honey and coconut oil or sugar? It uses honey and coconut oil – not granulated sugar. Anyway, what kind of wheat works best for every day use and bread making? Thanks! So I tried the recipe. My second attempt at yeast bread in 60 years! I did modify the machine speed slightly to not lag the mixer & damage it. But stayed true to the plan for the most part. Used coconut oil but used Agave extract in lieu of honey/sugar. I did this recipe & a no eggs recipe. Both turned out great! But your recipe tuned out bigger, fluffier loaves. I’m sold! It was easy! Anyone with a stand up mixer can do it! Thanks! Never buying bread again. Now I’m going to break out the wheat grinder!:). Thanks! Do you think it would be OK to freeze a risen uncooked loaf? No, you would not want to do that. You can freeze the dough, but don’t freeze it once it has risen. 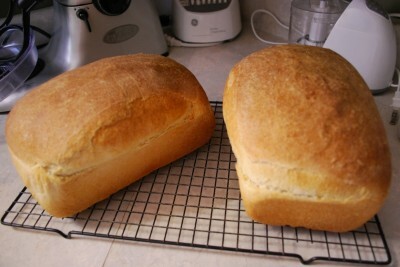 Having used your recipe I now love making bread because it is the best I have ever made. One issue I have is during the cooling all of the great rise and shape caves back in about 10% .. Taking away the great rounded top. The flavor and texture is 100% but it would be better if I could keep that nice round top.Any ideas what is going on??? The caving in is usually a result of too much rise. Try cutting back your rise time just a smidge and see if that helps. I’m new to bread making, I’ve been trying different recipes to see what works for me and what my family likes. We loved this recipie and my loaves were HUGE! So big we had to cut em in half for making toast lol! My kitchen aid couldn’t stand the full recipie, it just wouldn’t knead it properly. So I halved it and was able to make a loaf and 6 buns. Perfection! This is my go to bread recipe! We may never buy bread ever again! Lol love it and thanks for posting! Do you proof the yeast, or get right to it? I do not proof the yeast, but that’s because I use instant yeast. I am completely new to baking, so forgive my stupidity. I am trying to make this bread and I used half regular all purpose flour and half whole wheat flour. I have followed the recipe to the letter and my dough is in a bowl in the oven with the light on. It’s been in there an hour and doesn’t look like it’s risen at all. What am I doing wrong? Hi Jennifer – so sorry this response is late…I had a baby. Ha ha! 🙂 How did the bread turn out? Congratulations! It actually turned out great. I ended up letting it rise for several hours before it was ready. For the second rise, I turned my oven on it’s lowest setting and that sped it up. Thanks for all the help and a great recipe! I’m so glad it worked well! What kind of yeast do I use? Active dry or instant. Either will work fine. Made this recipe and absolutely loved it! Never buying store bought bread again!!!! I found you and this recipe yesterday. I made the recipe and had rave reviews last night from my hubby and a friend. Thank you! I make an artisan bread I really like but I think this will be my go to recipe for packing sandwiches as well as just bread & butter eating. I signed up on your blog…I enjoyed your writings. I’m so glad, Jeannie! Welcome to our community! Worst recipe EVER! Tried it, followed it to the word and I got an unrisen limp of dough. Went back through the recipe and double checked I didn’t miss anything…and again I had followed it just fine. So sorry it didn’t work for you, Janet. I’ve used it many times and get a great result each time. Maybe it was your yeast? Sounds like its user error. Everyone else on here loves it. Can you use unbleached flour? Thank you for the recipe. I’m really excited to try this as I currently have it rising in my oven. I was going to ask… do you think that my Kitchen Aid Artisan should be able to handle this mixing time with the amount of flour, or should I be taking breaks between the 10 minute mixing? My machine started to smell and even smoke a little bit on 1. Should I maybe just half this recipe or can I use less flour? I never had a problem with mine smoking…so if it’s doing that, it means it’s not able to handle the load. I would cut back to maybe 6-8 minutes per knead and see if that helps? I just realized it was probably because I used the dough hook both ten minute intervals. Not the smartest. Mine started smoking too. I wonder if your stand mixer is just more powerful than a KitchenAid and thus able to handle more dough. But the bread turned out really yummy anyway 🙂 next time I’ll cut the recipe in half though so my KitchenAid can handle it. Gotcha! I did call KitchenAid and they said it was smoking because I shouldn’t try to put more than 5 or 6 cups of flour in the KitchenAid. I’m sad because this is my favorite bread recipe! Do you think I can cut it down to 5.5 cups of flour and still have it turn out okay? Maybe if I cut back on the water and oil a little? I’m not sure, Lauren…I know bread can be fickle, but you could give it a shot! I just got a new Kitchenaid Pro HD Mixer yesterday for my Birthday. Happy 56th to me. LOL. I found your recipe online and thought.. this doesn’t look too intimidating. Its the first time I have made bread from scratch successfully. It worked perfect. Thank you so much for the easy to follow recipe!! That makes me SO happy!!! Happy Birthday! This recipe has way too much fat and sugar in it for me. You only need a couple of tablespoons of oil or butter and the same for sugar. I never add more than that. It doesn’t alter the flavor at all but it does save calories and cholesterol. I would also use one egg not two for the same reason and increase the milk by 1/4 cup to compensate. 🙂 I’m glad you’ve found a recipe that works better for you! I made this bread and it was delicious. There are some confusing bits, ESPECIALLY for first time bread makers. The long recipe shows regular oil and calls for sugar and does not give any quantities. The short version at the bottom calls for honey (not sugar) and coconut oil (not canola/veggie). This was my very first EVER attempt at making bread and did what I could. I used honey instead of sugar, but used canola oil as coconut oil is expensive ( i’d rather save coconut oil for my homemade chapstick). The bread came out pretty darn close to perfect. Some other adjustments were because I know my oven runs hot, I cooked for 20 mins instead of 30 mins. I did one regular loaf in a tiny pan and one round loaf. The pan loaf came out really good except the middle was still softer than I wanted. I’m sure lowering the temp and adding 5-10 mins will fix that. The round loaf came out perfectly and even help up for a Philly cheese steak sandwich for my husband. I would post pictures showing how awesome it came out, but the site says they are too large(?). Anyway, great recipe and a do over, today in fact. 🙂 That’s because when I originally wrote the recipe. I didn’t use those exact ingredients. So, over time as I’ve made things, I occasionally go back and fix the printable recipe with the EXACT ingredients that I use. A lot of people skip right to the printable anyway (Pinterest), so I was trying to get the most bang for my time. Hope that makes sense! My new weekly recipe, thank you! I substitute sorghum molasses for the honey (it’s so much cheaper), 3 c whole wheat flour and 3 1/2 c bread flour. I also had a problem with the large quantity in my mixer. I cut a circle out of a plastic ice cream bucket lid, cut a cross in the center and forced the dough hook top through it. It keeps the dough from seeping up too high. That’s a really great idea! Can you use stone ground whole wheat? Does anything change? I make your recipe every week for my family! We just love it!! Thank you SO much for sharing! My only question is if you have made buns with it? Just made this. It’s fantastic!! What a great recipe. Just for the record, I used white bread flour…should have used less water. I followed the recipe with 2 cups of water and it was almost too much for my 6- quart kitchen aid mixer to handle. I stopped half way through needing to give the mixer a break because it got so hot! I also used two teaspoons of yeast. I kinda guess at how much to use because the yeast quantity in the recipe is a little confusing to me at least. I really apppriciate your picture directions and how you described your recipe. “Thou shall not kill” lol really made following a bread recipe enjoyable. Thanks again! 🙂 I’m so glad! For the record, one package of yeast = 2 1/4 teaspoons of yeast. So you use sucanat instead of the honey? I can’t wait to try this. I have done that, but I don’t have as good of a rise as if I make it fresh. 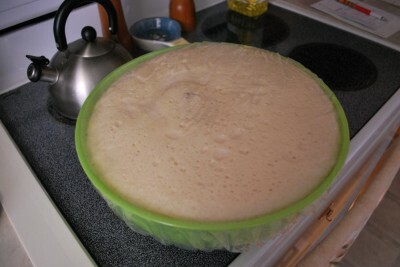 Once the dough has risen the first time, you can divide it and wrap it in plastic wrap and freeze in a Ziploc. 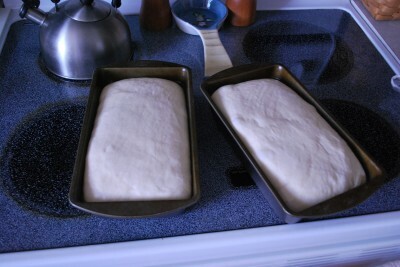 Thaw in the fridge and then let it rise in the bread pans to bake. this article was amusing to read. thanks for easy directions ! 🙂 Thanks – I am an amusing person. My dough came out very sticky, even after adding a total of 6.75 cups of bread flour…. I measured everything right. I don’t know if it’s the 80% humidity here, or if bread and I will never get along. I did! It was a big hit. It seems as though the dough is less sticky after it rises. I will be making it again! And my 1-year-old got a big kick out of me slapping the dough. He wanted to get in on the action. Hey – I ain’t gonna lie…slapping dough is a lot of fun. Oh yes. Wheat soaks up liquid like a sponge. Not sure if you will see this comment in time, but I plan to give this a try during my son’s nap this afternoon – (this is my first time ever trying to make my own bread, so forgive these possibly simple questions :P) 1. I only have one loaf pan, would I be better off halfing the recipe? or do i have another option to keep the dough ready to use until i have use of the pan again? — and 2. can the dough be frozen? if yes, at what point would you freeze it? I always freeze my bread after it’s made – I just find that it does better. I don’t have any coconut oil! What is a good substitute for that? I have regular vegetable oil and I have crisco. Well dang… I’m out of honey 🙁 These kids and their insatiable taste for honey on waffles. Does anyone know of a good honey substitute? I have made this recipe twice and it was great both times. One time I added whole wheat and still good. My mother LOVED it! Hooray! Thanks for letting me know!! This is now my go-to bread recipe. No more bread from the store! Just yummy home-made goodness. Thanks for this! Thank you so much for sharing the recipe! I just made it (first time ever making bread) and it turned out great! So excited to try more homemade breads and rolls – as I am trying to eliminate as much processed food/white sugar/ flour as I can from our diet. I used all Gold Medal natural whole wheat flour. Check out my Honey Oat Bread recipe too – it’s our total fave! 🙂 Congratulations on your first loaf of bread! WOOHOO!!!! I grind my own wheat into flour also and was wondering about your white wheat flour. I use prairie gold (which is hard white spring wheat)…is that what you used for this bread? I also have soft white wheat but I guess that’s more for pastry flour. And I have hard red wheat which I use as an all-purpose flour. 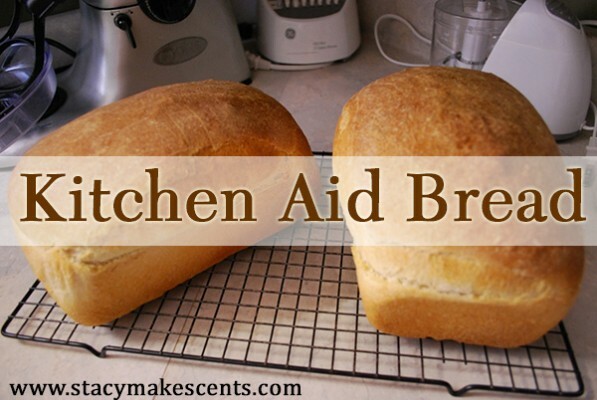 Making bread has never been a gift of mine, so I’d like to try this bread! I was wondering what I keep doing wrong. I’ve made this recipe a few times now and I can’t keep the dough from climbing up over my hook and making a big mess on the springs and the undercariage of the mixer. Do you ever have that problem? Have you ever tried greasing your hook? I think that might help? Good luck! What kind of bread flour do you use? Finally!! A bread recipe that rose and tastes good! Thank you sooooo much:) I was a little scared becasue I had to let it rise for about 2.5 hours but it is fabulous! I hope you don’t mind I am going to publish this on my fb page! Share away! 🙂 I’m just tickled pink it turned out great for you! As you know, I made this bread last week… I decided to share the recipe on my blog, and I linked it to your site. So happy you shared this recipe! I’ve used it (and variations) for years and it’s a no-fail deal. I had to giggle at your “ready to bake” ramikin & egg 🙂 BTW, you can use this to make a simple cinnamon/raisin bread too. Just add a little more sugar, add your raisins the last minute or two of kneading with the mixer. Roll out each loaf, spread with melted butter & cinnamon sugar. Roll TIGHTLY into a loaf and bake as usual 🙂 Enjoy! I’ve been making it for a while now. 🙂 I like to re-post old recipes in case people miss them. Not much better than cinnamon raisin bread! Ask Angela if she’s ever made this with half whole wheat flour and half bread flour? I’ve done this with a lot of recipes and it works “most” of the time. Yes, she has. 🙂 It’s in her notes. I use flour combos on it all the time. Today I used whole wheat and oat flour and it’s soooooooooooooooo good. This is my “go to” recipe. Not really…lol…space is limited. I barely have room for the kitchen aid. The one she had had a cool chamber and a dry one. You could put everything in it at night and set a timer. We used to make cinnamon raisin bread and it would be hot and ready the next morning. It’s amazing what kids remember most. I won’t ever forget that. My granny used to have a bread machine that we would use when I was there. I wonder if they still make those things? I used to have one. I got rid of it. I hated it. LOL It made square loaves and they weren’t pretty. You can use them for just kneading, but why do that if you have a kitchen mixer? Same purpose – need to save my cabinet space. 🙂 If you’re in the market, you could probably find one at a yard sale. I have never used butter in it but I have used coconut oil, safflour oil, canola oil and they have all worked so I think it would. This receipe is for me! Can’t wait to try it! Do you ever substitute butter for oil? Would it change the texture? 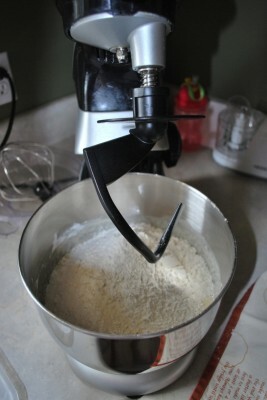 LOL…my kids have actually stolen my dough hook for my kitchen aid to use as a pirate hook on several occaisions.